To add new controls to the toolbar and delete unnecessary ones, you should make use of the toolbar data collection API. It will be described in detail in the next sections of this chapter. dhtmlxVault uses the Material Design Icons for toolbar controls by default. You can also use a different icon font. To apply a different icon font, e.g. Font Awesome, include it on the page with dhtmlxVault and use desired icons in the toolbar. Then you can apply any Font Awesome icon for toolbar icon buttons. Use the name of the icon as the value of the icon property in the object with the control parameters. See details below. 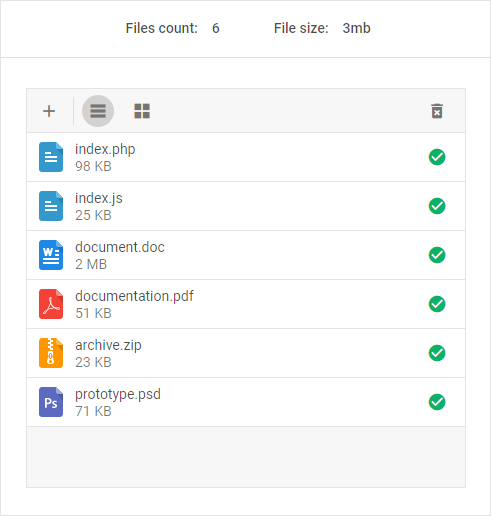 Vault provides icons for various types of files. Similar files extensions are combined into groups, for example: the "icon_image" group contains jpg,gif,png,etc. extensions and for all types in the group Vault uses the same icon. For all extensions that do not suit any of the groups the default icon is used. You can add a status bar for Vault to show some information about the files in the queue. A status bar can be placed in any place on a page and contain any data related to files.